The wide range of garden bars which we supply here at Fishers Woodcrafts come with a selection of many different products and specifications. Each of these products are made to top quality standards and the garden bars in particular are a BIG HIT amongst many who visit our site. Many of these bars come with areas to sit, stand and even an area for the selected bar tender of the night to be able to stand and pop behind the bar. With lots of different shapes and sizes it is certain that there is going to be something for you! Especially with the fact that all can be decorated with the bar accessories which we supply and examples of this can be found featured in many of our product images. These garden bars are also very practical structures which we supply as they have built in roofs so that the bar can be used in all-weather types! The bars are produced with a top quality timber which is made to last for many years and all products can be built to your specific requirements and tailor made to suit and fit in with certain designs which you may want. We believe that these bars are the best you can buy on the market and are built with both reliability and strength as well as genuine British craftsmanship. We find that within many pubs nowadays the prices are just soaring and cost extortion just to get a single pint (and even children soft drinks) making it a lot cheaper to have a night in at home with a few drinks whilst meeting friends and family there instead. But there is something which makes the idea of going and meeting at the local pub more sociable and attractive – and this is why we have created our own garden bars and pubs! 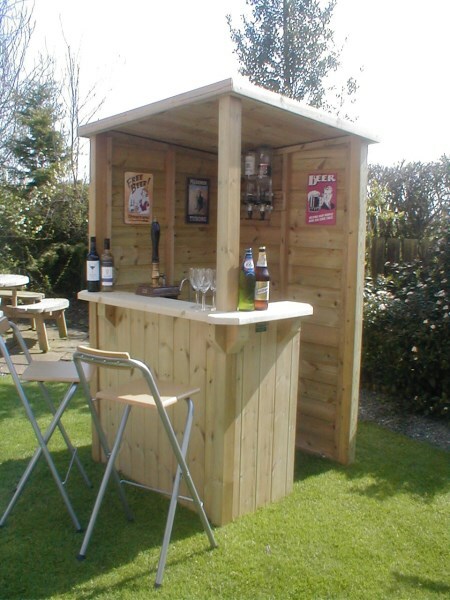 These are such brilliant inventions due to how much more sociable they can make your property by making you able to have friends and family round to your very own bar without the ridiculous costs. To be honest, let’s just face it… pretty much everyone wants one, so why not get one? SO why not invest in one of these brilliant and made to last garden bars! With them being the best on the market to a great and reasonable price it is an investment you will cherish forever and will definitely not regret! It gives people an opportunity to become more sociable in the comfort6 of their own homes and it only involves a few simple steps to get one ordered and on its way! It’s as easy as this, you can either order one of the standard products online or for specific and altered designs you can ring us up and discuss these on 01757 289 786. Other ways of contact include email via sales@fisherswoodcrafts.co.uk or filling in our contact form! We can also be found on social media sites such Facebook and love receiving feedback!